Is Empire still music to the ears of FOX’s audience? 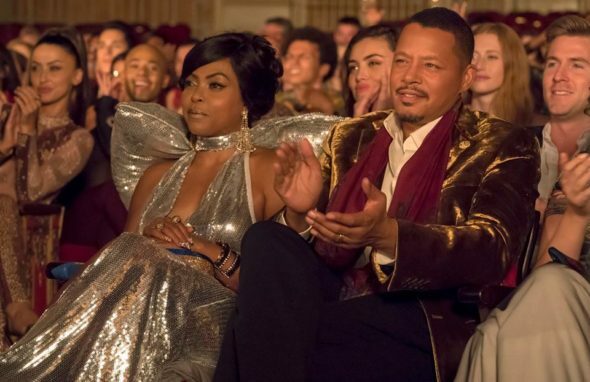 As we all know, the Nielsen ratings typically play a big role in determining whether a TV show like Empire is cancelled or renewed for season six. Unfortunately, most of us do not live in Nielsen households. Because many viewers feel frustrated that their viewing habits and opinions aren’t considered, we’d like to offer you the chance to rate all of the season five episodes of Empire below. A hip-hop music drama series airing on FOX, Empire stars Terrence Howard, Taraji P. Henson, Bryshere Y. Gray, Jussie Smollett, Trai Byers, Gabourey Sidibe, Ta’Rhonda Jones, Serayah, Andre Royo, Rhyon Nicole Brown, and Nicole Ari Parker. The series revolves around the Empire Entertainment company, founder Lucious Lyon (Howard), his three sons (Gray, Smollett, and Byers), and their mother, Cookie (Henson). The Lyons lost the company in season four and season five finds the clan still trying to reclaim Empire two years later. What do you think? Which season five episodes of the Empire TV series do you rate as wonderful, terrible, or somewhere between? Are hoping that Empire will be renewed for a sixth season? Don’t forget to vote, and share your thoughts, below. Please renew Empire 6th season. It’s an entertaining show and viewers and Empire staff, actors, and others, should not be punished for Jussie Smollett’s actions. Eliminate his character if that’s what it takes. In my opinion, he’s not the star and can easily be replaced. Please continue this show. Even if Jussie leaves or fired I believe this show will still have great ratings. I am sill a big fan of Cookie and Luscious as well as the rest of the cast. I live for Wednesday nites when this show comes on. I love Empire. Bring Jussie back!! CANCEL the SHOW! After Jussie Smollet’s disasterous HOAX, I can’t watch the show anymore and I was a BIG FAN! Either that or fire him so that I don’t have to look at him anymore! Can you bring Lucifer back it was a really great show?